This title is an evidence based book that connects the theoretical and practical aspects of human movement and posture and provides basic information for therapists working with people with postural disorders. Practical material is approached area by area so that therapists can easily access the information they require. The anatomy and kinesiology of the locomotor/musculoskeletal system is covered and common pathologies and postural disorders reviewed. Dr. Gill Solberg is a graduate of the Zinman College at the Wingate Institute, Israel, with a specialization in postural disorders. During his graduate studies he specialized in Clinical Kinesiology and Adapted Physical Activity for populations with special needs. His doctoral thesis was on this subject. For 12 years Dr. Solberg has been a diagnostician and head therapist at the Holon Therapeutic Sport Center in Israel and was also in charge of hydrotherapy and adapted movement for children with postural disorders. Since 1994 he is a lecturer at the Seminar Hakibbutzim Teachers College and at the Zinman College of Physical Education and sport sciences at the Wingate Institute. He also conducts inservice courses for rehabilitative movement therapists. Dr. Solberg has published many articles and has presented his work at many professional conventions around the world. 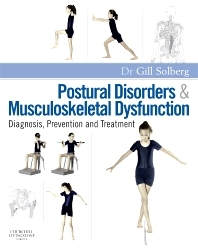 "Dr Solberg has managed to produce an easy to use, comprehensive guide to posture in this book. He has taken each area of the body and shown how it is affected by postural changes, described them in easy to understand terms and given a great range of exercises to help with them. The exercises and poses are both clear and self explanatory with good use of photos… The step by step approach in the book reflects the process needed to deal with any musculoskeletal problem and I highly recommend it."